Video Game Repair / Refurbishment Rates. Listed here is our labor rates, service area, travel fees, charges and the amusement game types we work on. Our repair shop refurbishment, restoration labor times and costs. Game Plan, Sega, Midway, Genco (EM gun games only) arcades. EM=Electro Mechanical Arcade Machine (Relays, Score Reels), SS=Solid State/Electronic Arcade Game (Chips, Transistors, DMD/Digital Displays). Amusement arcade game repair refurbishment of both EM / SS Pinball and Video Games. Labor rates costs and service area. On site or at home game repair in Austin, Texas. Pinball Medic is one of the last repair shops open in the United States and in Austin, Texas that can clean, repair, refurbish and restore both Electromechanical and Electronic Arcade coin operated amusement, arcade, video arcades games and pinball machines. The minimum field service cost is $200. $100 field service fee + $90/hr+$10 gas fee*. Playfield rubber ring kit installation and playfield cleaning is charged at a game specific price plus parts. Game Inspections prior to buying or selling your pinball. Minimum charge $35, if located in Austin. No inspections for insurance clams. We are willing to do "House Calls", in Shop or Commercial site game repair on full sized coin operated amusement pinball machines and video arcades in and around Austin, Texas. We repair, refurbish, restore, upgrade and modify (mods) Solid State, Electromechanical (EM) and Electronic Amusement Equipment, Video Arcade Games and Pinball Machines. This includes early relay operated electromechanical EM gun games, woodrails and arcades to the most modern coin operated electronic pinball machines and Video arcades. We go on site service calls to most locations in and around our local Austin, Texas service area to clean, service and repair pinball machines, full sized coin operated video games and other amusement devices. Call, or E-mail us for more information or to schedule a service call. Most on-site service calls are limited to basic repairs or playfield cleaning work. If your game requires extensive labor time or parts, it needs to be brought into our repair shop for service. We can make arrangements to have you bring in the game, or if our schedule and workload permit, we may be able to pick up and transport your game at an additional cost. A partial parts and labor payment is due before we start any work on your game. Full Payment is due the same day the repair or game inspection is completed using one of our payment methods or Contact Us for more information. Field Service Labor Rates Non - Code Blue rates. Field Service Fee $100. (Non-repair shop game repair). The minium in our service area field service cost is $190. $100 field service fee + one hour labor. ($250 for out of service area field service, $230 Code Blue and $260 for out of service area Code Blue service calls. Miniums include first hour of labor and field service fee). Pinball Machines and Video Games are serviced and refurbished at the same hourly labor rate. Arcade Game Repair Labor Rate is $90 per hour with an one hour labor minimum. $22.50 per quarter hour after first hour. The Field Service Fee is not charged on every round trip unless the destination is far outside of our Service area 60 miles or more from Austin, Texas. We will charge another in service area field service fee if our gas and milage costs exceed the service fee and we have to do multiple round trips. Video game Monitors must be removed as field service and repaired at our Austin repair shop - normal field service rates and fees apply. In Shop repair labor rate is $90/hr. for both video and pinball arcade games. Field service and game transportation fees are waived if the game is dropped off at our repair Shop. Game parts are not included in our labor rates, bids or quotes. E-mails are not considered the same as a signed service contract. Quoted/Estimated costs in an E-mail can change without notice due to our labor and part costs during a repair or refurbishment depending on the condition of the machine and the availability/costs of replacement parts. 'CODE BLUE' Emergency / Priority Game Repair Field Service Rates. $130 per hour (Inside service area, $260 outside of service area.) - All minium rates include the first hour of labor. Side artwork, monitor capacitor kits and other major parts are not included and will not be done as part of a CODE BLUE service call. Parties and special events are what usually require Code Blue service. Emergency Repair may not be available every day of the week and at all times of the day. Our shop is usually full and we need to keep working on arcade game repair and refurbishments. 'CODE BLUE' EMERGENCY COIN-OP PINBALL, ARCADE OR AMUSEMENT GAME REPAIR. Your game is put ahead of all other field service calls. Additional Fees and increased Labor Rates apply for this Special Service. Include the words Code Blue in either the Comments section of the online Contact page or in the Subject line of an E-mail. Austin Texas, Coin Operated Arcade Game Repair and Refurbishment Labor Rates, Travel Fees and Service conditions for in the Home (House Call) Arcade Game Repair. Commercial Arcade Game Room Field Service Costs, in our repair shop Refurbishment and Amusement Game Restoration Labor Times and Rates. Pinball Medic will not work on, sale or restore the following types of coin-op amusement games: Skill Slots, Crane games, 8-liners, Money Change machines, "home use only" arcades or Dollar Bill Accepters. Gambling devices and Slots that are newer then 30 years old can't legally be serviced without a special Texas license. We are not aware of any shop in Texas that can fix a gambling device not even one in a home game room. Pinball Medic can no longer offer insurance damage inspections or repair games damaged by shipping, water damage or any repair/restoration that is paid for by insurance. We can't get insurance companies to pay us after sending in detail damage reports. They never intended to ever pay either the policy owner or Pinball Medic. We can no longer afford to offer this service. No local business will do this type of work either. *Home version arcade = Game does not have a coin door or is not a full sized coin-op arcade style game. The "home use" type of game uses impossible to find proprietary parts and cannot be refurbished or repaired. No Major Parts included in typical costs. Inside service area fees and rates. Outside Service Area Milage was not included. Part costs vary with Game Type (EM/SS) and are Arcade Title Specific. Your final costs for parts and labor may vary from this chart. (NOT CODE BLUE) In the Home (House Calls), Game Room or Arcade - Video and Pinball Machine Repair. $90/Hr. parts costs and in our service area FSF. Field Service Calls Priority - Game Repair Field Service Calls and at our shop emergency game repair. $130/Hr. Does not include monitor repair parts. typical parts costs and FSF. In repair shop service. In our shop Repair, Refurbishment and Restoration Service . $90/Hr. $125/Hr Code Blue Shop Repair Field Service Fee (FSF) is waived when the game is brought by the customer to our game repair shop. More parts are usually replaced in shop due to parts availability and extended game inspection time. This refurbishment level mostly applies to Pinball Machines. Video Games are usually fully refurbished. or See this Tech Tip Minimum level of cleaning and repair. Done either as part of the game's field service* or in the shop repair. *Not all Cosmetic Refurbishment can be done as field service. Field Service or in our shop. Very Game Specific on total costs. Labor and Parts costs can increase with the level of refurbishment (from Basic to Top Level cosmetic refurbishment). There are many sub-levels of Cosmetic Refurbishment based on game complexity, if the playfield is dis-assembled before cleaning and if it is to be waxed, if refurbishment is done as field service, etc. Grease on game parts removal can not be done as field service. Fees are the same as Field Service or the Field Service Fee is waived when the game is brought to our shop by its owner. Parts costs average doesn't include new replacement circuit boards, monitor (new or rebuilt), displays and other major game parts. Labor starts at $750 for a top level "Cosmetic" Refurbishment for most arcades. Labor can be higher or lower then $750 depending on the amount and level of refurbishment. Labor is included in Bid or Estimate and varies by game complexity, EM/SS game type and the game's starting condition. Four player EM Pinball Machines require a higher starting price ($850 or more) because they have many hard to refurbish score reels and stepper units that need to be cleaned then an one or two player EM pinball. In shop only. Every mechanical unit in the game is disassembled, cleaned and/or replaced (replaced as needed). Playfield is cleaned and waxed (Wax is Optional). Game Specific Grease Removal Fee and other game condition refurbishment fees are added and are game type and condition specific. or more if new circuit boards, score board glass, monitor and other major parts are needed and approved by the game's owner. Bulb swap outs are not included in this estimate. It usually takes at least 60 bulbs (6 boxes of 10 lamps) Labor starts at $850 for most Pinball machines, plus parts. Labor is included in Bid or Estimate and varies by number of players on EM arcades, game complexity, EM/SS game type, number of players on EM pins and game's starting condition. In shop service only. Done after the game's Full Refurbishment. Game Specific No fees except for grease and other removal fees. Restoration can add 12-20 hours of labor to a Full Refurbishment. Full Refurbishment costs + parts + additional labor costs. (game parts, paint, replacement wood/cabinet) Full Restorations can add major labor time and parts costs. Restoration can add more then $1000 to a typical Full Refurbishment. Each major part of a game's restoration must be cleared by the game's owner before the work is started. Most good old time pinball and Jukebox repair shops have gone out of business in the U.S.A.. Arcade refurbishment has now become increasingly important because of the recent surge of pinball game worth and the irreplaceable nature of no longer manufactured arcade amusement parts. A good refurbishment or restoration increases and preserves the value of any arcade game. This type of work requires a vast amounts of experience, very labor and time intensive. Game Restorations and Refurbishments are now done as estimated bids only, starting at our minimum labor costs for the type of arcade, it's rarity and condition. Some EM or SS pinballs and arcades are known to be "resurrection nightmares" and we take this into account during the bidding process. EM pinballs (likely four player EMs) take considerably more labor and potentially more parts to repair or refurbish, the minium for starting the refurbishment on these pinball machines is higher then the normal costs of other types of games. Additional work or unforeseen part orders will not be done until the game owner signs off on any costs over-runs or bid amendments. Pinball Refurbishment Levels Our definitions and other information for the terms Shopped, Refurbished (Cosmetic VS. Full) and Restored. A Cosmetic Refurbishment ( C-R ) includes topside playfield disassembling for cleaning and inspection, circuit board trouble shooting, repair and replacement of any defective playfield parts (Limited to consumable game parts. Does not include full mechanical units, displays or other large and expensive game parts, but may include the labor to install them.) and the repair of the game. This level of refurbishment can sometimes be done as field service depending on the game's condition and playfield complexity. See the Pinball Board Repair page for labor rates and times for repairing circuit boards. A Full Refurbishment ( F-R ) includes inspecting and disassembling every playfield, backbox or game cabinet's mechanical part or circuit board. These often dirty or greased units are cleaned, repaired or replace if we consider the part to not meet the original game specifications. If there are new parts with a longer longevity or are of higher performance available, we will replace these parts. For example, metal coil sleeves do not perform or last as long as the new plastic sleeves. We will replace all metal coil sleeves during the pinball's full refurbishment. Refurbishment Minimum Labor Costs - Amusement Game Refurbishment / Restoration. Parts are not included in the minimum labor costs. Top Level Cosmetic Refurbishment of a SS (electronic) pinball will normally start at $750 + parts. This level of refurbishment includes game repair and playfield cleaning ( Playfield cleaning includes a new rubber ring kit ). One and Two player EM pinball machines Cosmetic Refurbishment rate starts at $850. Four player EMs and very old EM pinball Cosmetic Refurbishment will start at $950 because of the increased amount of labor needed to repair and refurbish the score reels and the increased number of stepper units in these types of pinball machines. If a four player EM pinball doesn't need many of the score reels or many mechanical units refurbished, then the minimum labor costs will be set at $850. Video games and EM arcade machines use a game specific labor and parts minimum that is in the ball park of what we charge to refurbish an electronic pinball game. Although classic video games including vector monitor games and extremely rare EM arcades can require a high cost on large parts like stenciled side art, replacement control panels, buttons, joysticks, relays, special solenoid coils, monitors (rebuild kits) and marquees. We should be able to give refurbishment costs before the work is started. However, with very old and valuable games, we can't guarantee our first quote will be accurate or in the ball park of the final charges. The game's owner will be contacted before we start on something that was not accounted for in a repair or refurbishment cost quote. Expensive Game Parts and Assemblies requiring shipping/ordering (For example; Pinball MPU/solenoid driver circuit boards, coin doors, pinball legs, new monitors, solenoid coils, etc.) will be paid for in advance of being ordered from a third party manufacturer. We will no longer put these parts on our business credit card. We've had too many issues with being reimbursed for expensive and game specific replacement parts. The refurbishment or game service can be stopped for not paying us for these hard to return and expensive parts. We have had to stop all labor on only a very few games for non payment. Coin-Op Arcade Game Repair Request - Use for both Video or Pinball Repair. We work on most arcade machines including these manufacture's games Williams, Bally, Gottlieb, Gameplan, Stern, Data East, Atari, Genco (EM gun games) and Sega Pinball games and most full sized coin operated arcade video games. Pinball Medic's FIELD SERVICE AREA Coin Operated Game Full Refurbishments and Restorations can not be performed as Field Service. Cosmetic Refurbishment can be done as a Field Service call on a limited basis and game type. This service is usually limited to Pinball playfield cleaning and installing new rubber rings to inspection and minor repair of control panel buttons on Video games. Our Field Service Area is limited to a 35 mile radius of the Austin, Texas area. Only during rare ebbs in our workload can Pinball Medic schedule special service area extensions that have in the past included all or part of the towns listed in the left side panel. Because of the random nature of field service calls and our limited shop space, not all service or refurbishment can be accepted. However, we will put your game on a waiting list and try to find another shop in your area if the list gets too long. Out-side of our service area repair is very limited by our spare labor time, gas prices and distance to be traveled. We lack the resources to do this kind of service call very often. Due to the ever increasing price of gas, we will not travel to Dallas, Houston or other distant places from Austin for field service game repair. Additional fees and mileage charges apply to outside of our service area game repair. Game warranties do not extend to any game outside of Pinball Medic's service area or for games shipped out of our service area. High gas prices have limited our field service range to central Texas. Diagnostic Fee - $35 Charged if the game or monitor is not repairable. This is in addition to the field service fee and our minimum labor charges. Field Service Fee $110 This fee is waived if the game or monitor is delivered to our repair shop in South Austin, Texas. Game Transportation / Travel Fee - $110 - Applies if the game is picked up by Pinball Medic inside of our normal service area. The transportation Fee increases to $150 + Gas + mileage if we have to travel outside of our service area. This fee will need to be paid for in full before we pick up the game. Our total travel distance is limited. We will not drive to Dallas or Houston to pick up a game. We can not pick up a game that is not on the first floor of a house or building, or if there are obstacles like stairs. Pinball Medic Amusements charges 61 cents per mile (set by the IRS) if we have to travel outside our normal service area. Mileage is calculated round trip from our South Austin repair shop. Mileage is in addition to the Field Service or Game Transportation Fees and any other appreciable costs and fees. Grease Removal Fee ($25 and more) - Pinball Medic will charge this fee if any plastic game part has been greased. Never grease plastic game parts. We have to disassemble the mechanical units in a game to search for this problem. This adds to our labor time. We charge a $35 fee on top of what the bank charges per check for insufficient funds. Due to too many issues in the past, we have had to adopt a restrictive storage policy on games that are to be stored at our shop after the work has been completed, abandoned games (either paid for or not), the game's repair/refurbishment was canceled, and/or the game is waiting to be picked up or delivered. Please read the following important information. If you have a game at our shop that must be stored before it can be picked up or delivered. We are not a storage facility, and have very little space in our shop to store games. After the game is finished, please be courteous and make arrangements to pick up your game, or to have it delivered, as soon as is possible. Any game left at our shop for more than four days (96 hours) after being repaired, refurbished, restored, any other service has been completed or after scheduled or estimated pick up or delivery time, will be subject to a storage charge of $50.00 per week, per game, with a one-week minimum charge ($50.00 each game per week). This charge must be paid before the game can be picked up or delivered. See our Payment Methods for more info. Any game left or stored at our shop for more than thirty (30) days becomes the property of Pinball Medic, and will be sold to cover any applicable repair, service, and/or storage costs. Any payment or deposit received will not be refunded, and is forfeited along with the game. If the game does not sell, and the original owner returns to claim the game, owner immediately pays any outstanding charges and storage costs, plus additional storage charge of $50.00 per week, per game, with a 1-week minimum charge (per game), for the amount of time the game was stored at our shop beyond the original thirty (30) days. Storage fees must be paid IN ADVANCE. Cost is $50.00 per game, per week. Any game that has not had storage paid for it after 30 days becomes property of Pinball Medic, and will be sold. Any payment or deposit received will not be refunded, and is forfeited along with the game. We are NOT RESPONSIBLE for any goods left at our shop for more than 30 days that have not been claimed or that have not had storage fees paid on them. Any paid on games or parts that are left at our shop for more than 30 days are the property of Pinball Medic and are completely non-refundable. Games we sell only need a minimum of setup once they have been moved to a location. Usually no setup is required with video games other then plugging the game into a wall outlet. Game delivery and setup is available at additional cost on most games we sell to local customers within our Full Service Area (see map below). Cost varies depending on the game, your exact location, and other variables, such as complexity of delivery (No stairways, more than 1 person needed for delivery/game moving, etc.) Local customers can pick games up at our shop at no extra charge, or if you are interested in having your game delivered and set up, e-mail us for more info. Customers located out-of-town, or outside our Full Service Area will need to make arrangements to pick up their game at our shop in person, or have it picked up and shipped to them by a freight carrier or moving company. We can prepare a game for shipping for an additional cost. Details on finding a freight company to pick up and transport the packaged game for you can be found on our Game Packing and Shipping section with additional information available on our arcade Tech Tips page and on our soon to be updated game shipping page..
More than one (1) person from our shop needed to move game(s) into a bottom floor location. If other related heavy lifting/moving or a game needs to be moved to or from a second or higher floor is required, then a moving company must be hired by the owner of the game. Pinball Medic will not be able to deliver a game to a location that is not on the ground floor and can not move a game up/down a stairway. We are not an arcade game moving company and lack the labor and equipment to do this kind of service. Time/labor to remove and re-install any parts of the game in order to get it into your location (or through narrow doorways), and set up. Removal of any doors, furniture, or any other items at your location in order to deliver and set up your game. Any return trips to deliver or set up your game will be charged a Minimum of $150 (no one home, unsafe delivery conditions, locked gate, etc). Doors, handrails, furniture, or any other items at your location that we move or remove to deliver your game. Damage to the game or any breakable game parts. Damage to concrete, decks or lawns. Damage to, or dirtying of, any carpets, floors or dry wall in your location from moving the game. Return trip(s) to your location for any additional delivery attempts, or if delivery conditions are not acceptable/safe, or if any payment due at delivery is not ready (cash only). Safety is our number one concern when delivering and setting up a game. We reserve the right to refuse delivery and/or setup if any hazardous or difficult conditions exist that could cause damage or harm to the game, yourself, your property, our employees, or if other delivery or payment terms or conditions are not met. A return trip can be rescheduled if any of these conditions are present, for an additional fee (see above). Please be sure to have all preparations made before we arrive to deliver your game. Please understand that we are often on a tight schedule that involves other customers and often other deliveries or appointments on the same day, so we must charge for any additional time that takes away from our schedule and other customer's schedules. Pinball Medic services the following manufacturer's pinball games. Williams, Bally, Gottlieb, Data East, Sega, new and older Stern, and Atari. We also service most kinds of full sized coin operated video games. Please check with us to make sure we can repair your game before we start a field service call. No mail-in board repair. We will not fix Arcade game circuit boards by mail, "HOME version" *arcades and pinball machines, Touch Master or any bar top arcade, Shuffle Alley, ball or puck bowling games or any type of gambling device (8 liners,slots). Costs can vary depending on exactly how far back in time you want to take your game, or the starting condition, type and complexity of the arcade game and what new or refurbished parts need to be installed. We charge a competitive hourly rate for our time, plus any part costs that are required. We except cash, checks and money orders for parts, dollies and game sells ordered on-line with destinations inside the U.S.A.
A waiting period will be imposed of 10 business days on new customers not paying with cash and residing outside of our normal service area. For games serviced at our shop, we accept only cash and local checks. We do not accept checks unless they are drawn on a local bank and received 7 or more business days before the game is picked up or delivered. We are sorry for any inconvenience, but due to too many past problems with bounced and returned checks, we are forced to no longer accept checks at the time the game is picked up. We add a charge of $35 for any bounced or bad checks we receive. Coin Operated Video Arcade games and Pinball Machines are repaired at the same hourly rate. A typical full pinball game refurbishment takes 16 to 20 hours to complete or more if the game is in bad shape. Labor starts at $950 for a full refurbishment. The labor for a 'cosmetic refurbishment' starts at $750. These quoted costs do not include any new or used game part costs used in the repair or refurbishment. A full game restoration starts after a full refurbishment and can add many more labor hours to the typical full refurbishment labor time. Electromechanical pinball games take longer to refurbish then any other type of Arcade game. Four player electromechanical games have more score reels and take many hours of labor to restore. Therefor, the labor costs will be higher. A full and complete arcade game (Video or Pinball) restoration can increase the amount of shop labor time 10 to 25 hours. The following varies according to initial game condition and can be game specific. The following labor intervals are approximate and very game specific. Refurbishment can take 25 or more hours to perform on a complex multi-level playfield that has a lot of mechanical or electrical / electronic issues (For example; a Twilight Zone Pinball). The customer will be informed before the work is started. Game consumable like playfield game balls are always replaced. Playfield waxing will usually be done to only none dry cracked EM pinball games unless requested by the game's owner. Waxing and a new set of game balls are the best way to protect the game from wear. - Disassembling and Cleaning of playfield, playfield plastics, posts, ramps, ball shooter refurbishment or replacement, cabinet cleaning, relay refurbishment, Installing a playfield rubber ring kit, etc. - Inspection and repair of pinball playfield and backbox mechanisms (playfield toys) - All playfield 'toys' and mechanisms are disassembled during inspection and thoroughly cleaned and replaced if necessary. - Inspection and repair of game electronics or game relays and mechanical devices other then the game specific playfield toys. - Repair and Restoration of the Game's electronic circuit boards, connectors, light socket replacement, etc. If the circuit boards have been "hacked" or have extensive battery acid damage, a new replacement circuit board will be used (if available). See our new reproduction Pinball Boards or Board Repair Work pages. - minor cabinet, coin door, leg detailing and playfield waxing. New cabinet legs, adjuster feet and leg bolts are recommended to reduce the labor time and improve game's appearance. Pinball Medic will add a grease or oil removal fee to any pinball that has had its internal parts greased (heavily greased). This Fee will start at $20 and go up if extensive use or very heavy amounts (globed on) of grease or oil was used. If there are any animal waste deposits or the game is very corroded or has been sprayed with WD-40, there will either be a very large cleaning fee or we will end the refurbishment. Please DON'T GREASE ANY PART INSIDE, OUTSIDE OR UNDERNEATH A PINBALL GAME! Pinball Machine Restorations happen after a game's refurbishment and can add 10 to 15 or more hours of labor (for extensive restoration). This would include major cabinet and backbox reconstruction or replacement and any other major game part rework or cabinet / playfield painting. Any playfield touch-up or major playfield hole repair, scratch removal, extensive cabinet carpentry work or any other work that requires extensive labor hours to perform or special game specific parts such as insert decals is considered a game restoration and can add 10 to 40 hours or more in labor depending on "how far back in time you want to take your pinball machine". Adding a sub woofer and amplifier kit to a pinball, such as in a Medieval Madness, would be considered part of a restoration and not part of the refurbishment. Game modifications (Mods or Upgrades) include, but, are not limited to: Adding LED(s), ramp and hole protectors, custom playfield plastics and game ROM and stabilizing backglass artwork. Anything that was not installed on the game at the factory is considered a game modification. The exception to this are game specific modifications that were provided by the game's manufacturer to repair a design flaw on the pinball's playfield. These "issues" will be dealt with on a game by game basis as far as additional costs and part availability are concerned. A Cautionary Tell: There seems to be a great amount of difference in quality of work, skill/craftsmanship and reputation between Texas (and in many other states) Coin Operated arcade game repair/refurbishment shops. A few shops (even one locally) will not bother to replace a rusty game ball during a pinball refurbishment or will clean a playfield without disassembly (using only a dirty rag, it seems!). We've seen bad shop work in the past so often that we used to charge a fee to redo their 'repair' or 'refurb' work. We have worked on what they sell as shopped out Examples of some of their hacks are on our hacked repair page. Using our own observation, some coin-op shops don't have the experience, mechanical skills or electronic repair education needed to do an arcade refurbishment, restoration or game repair and therefore can't, and should not, work on electromechanical, electronic pinball or any other type of arcade game. To try and preserve as many arcades as we can, we ask you to do some research before handing your game over to a stranger or repair shop. We waste too much of our time fixing what the other shop "repaired", sold to you as "totally refurbished" or games from E*ay and Cra*g's L*st. Coin Operated and Coin-Op game restoration or Refurbishment Request page. Texas is full of gated communities, private property gates and area entry security. Gate key codes MUST be provided or at least a way to pass through a gate to our driver. Gate security guards must be informed of our arrival before a delivery or field service is attempted. Our technicians have often driven for 30 or more miles (one way) just to be blocked by a locked gate. A locked gate or non payment can get a customer banned from all of our services and can cause storage fees and other costs to occur. We don't except any excuses for a locked gate. The former customer knew about the gate a long time before we got to it. We will get paid for our work on the same day it is done. We never want to ban people or businesses from the services we provide. We always keep this 'nuclear option' as the last possible outcome. However, like any other business, Pinball Medic must make a profit on everything we do to survive. When we waste a half a day driving a long distance without any way to complete the job, we will start on the next machine at the shop or the next field service call. All work on your game will be very delayed, canceled with all new parts removed or/and downgraded to the most basic cosmetic refurbishment level. Any storage fees or other charges will be added. We can get, after a 30 day waiting period, a mechanic's lien on the game and after 30 days without full payment, we can sale your game as reimbursement for any costs, parts or game storage or other fees you owe. Why should you care about banning? Banning lasts a lifetime on any service we provide. Costs and fees will be added to any games we store, have repaired, refurbished, restored or sold and on games with parts and/'or labor costs still owed to us. 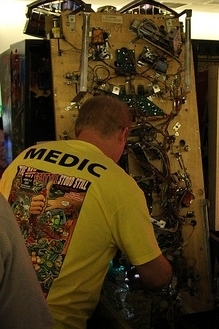 Pinball Medic is one of only a very few remaining good amusement game repair shops in Texas and in the nation. We do talk to most of our competitors and can find out the game's history relatively quickly. We already offer very competitive rates, but by NOT doing right by us to save a little on a repair or refurbishment through non payment, being unavailable or trying to get free labor or parts, you will be making your game(s) non-repairable in the future. You could also loose the game as we can sell it to reimburse our costs. Preventing us from completing a delivery, game pick up or completing a service call with a locked gate, very poor driving instructions or any other means (guard dog, etc). Not paying Pinball Medic in full after a repair/refurbishment or for new, use or expensive parts, fees and storage prior to starting a repair/refurbishment. If you can't pay us by one of our payment methods then tell us before the work is started, not after it is completed. We will not allow games to leave our shop before all payments have been completed. We reserve the right to downgrade a refurbishment or cancel the work due to lack of payment and transfer game's ownership to Pinball Medic after a waiting period. Unpaid for parts will be removed from the game. Not reimbursing us for the labor or for any new/used parts. This includes labor and parts even after a service was terminated before it could be completed. If we find past history of bad dealings with other repair shops. Too often, in the past, games would be delivered from well beyond our service area because other shops would not accept a game (customers never indicate this has occurred) or a repair was done incorrectly and has damaged the game. There could be a reason why you are having "trouble with other shops" and have to travel hundreds of miles to get your game refurbished or repaired. We are not the "last chance shop" and will not be held responsible for other repair shops repair, refurbishment or restoration. We do our best to filter out people who purposely travel from one shop to another to "scam" labor and parts from each repair shop. This practice can make the game non-repairable and can get the game's owner banned from one of the last and perhaps best coin operated repair shops in Texas, Pinball Medic. Not all repair shops are what they claim to be. We know that issues might have been caused by previous repair that was done incorrectly In some of these cases, we try and repair the bad repair, however, many are just too far gone to do anything on the hacked repair job. We reserve the right to decline to work on any game for any customer and for any reason. Your check bounces for any reason. There is a 14 business day waiting period on all checks to make sure they are valid before the game can be removed from our repair shop. If a local bad check is presented to us without any intentional fraud taking place, we will expect cash as the only payment method and will add a $35 fee for each bad check. Having us make multiple trips to a location to get paid for previous work. We are willing to work with you during a field service call, however, trying to get free labor each time we arrive at a location because the customer didn't have a way to pay us and didn't tell us before we worked on their games, will get you banned. Even if you have multiple games in need of repair. Gas is expensive and our time is valuable to us. As stated before, we will no longer work for game software design companies. They pull this "stunt" every time. Any illegal activity on the part of a customer. Scams and other illegal activity is obviously grounds for being banned for life. Illegal or legal drugs are NOT included as one of our payment methods and are NOT accepted as payment for any services or game parts we provide. Don't try anything illegal with us. You could loose your game and/or any payments. Copyright 2019 pinballmedic.net All Rights Reserved.